Saudi Arabia Elects Its First Women To Municipal Council : The Two-Way Few women ran and few women voted during the elections, but many in the country see the victories as a turning point for women's rights. Women walk out of a polling station after casting their votes for municipal elections in Riyadh, Saudi Arabia, on Saturday. 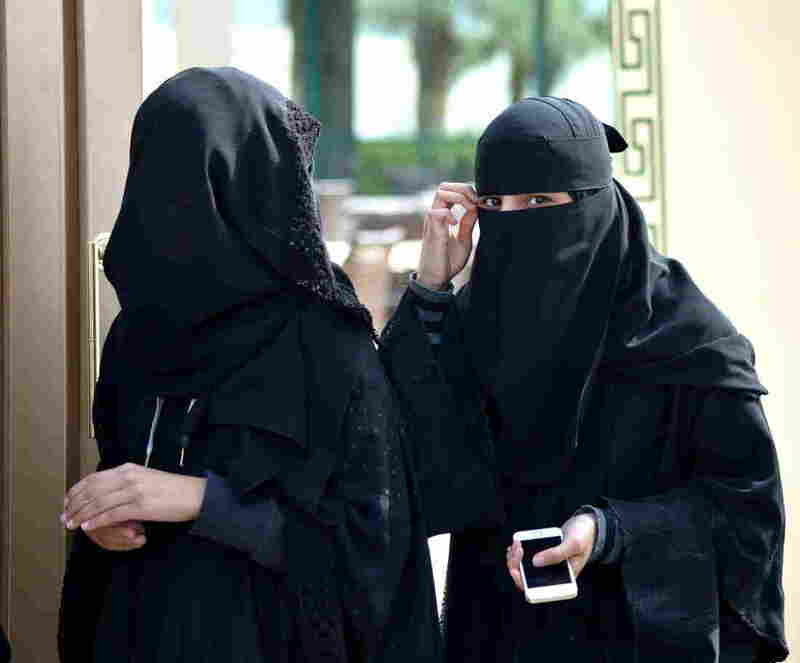 It has been a season for firsts in Saudi Arabia: During the run-up to the country's third-ever elections, the absolute monarchy decided to to give women the vote and to also allow them the right to seek positions on the country's municipal councils. Today, the government announced that several of the 979 women who ran had been elected to the council. NPR's Deborah Amos, who is reporting from Saudi Arabia, says the government announced the first official winner early on Sunday. Salema bint Hizab al-Otaibi was running against seven men and two women and won a spot representing Madrakah, a small village just north of Mecca. "Only 130,000 women registered to vote, compared with 1.36 million men. Several women blamed the cumbersome registration process for the low numbers. Many others said they simply didn't care. "But in an ultraconservative country where women are deprived of many basic rights—such as the ability to drive or to travel abroad without the permission of a male relative—many female voters see their inclusion in the election process as a turning point. "'I have goosebumps,' said Ghada Ghazzawi, a businesswoman, as she entered a polling station in Jeddah on Saturday. 'We have been waiting for this day for a long time.'" NPR's Rachel Martin is in Riyadh to cover the elections. She says that during her time there, she has heard a wide range of opinions. "One woman told me that being able to vote was the equivalent of being given a cashmere sweater when she needs a place to live. She just doesn't see how this vote will affect her daily life," Rachel said. "Other women told me that being allowed to run for public office and vote for the candidate of their choice may not move the needle on big women's issues but it's a powerful symbol - and change, they say, has to start somewhere."